Katie Kissel was stunned when, she says, Dr. Dawn Mandeville didn’t wait for her consent and cut an episiotomy on her during her first baby’s birth at Dekalb Medical in Atlanta, Georgia. The doctor simply stated she was going to do it, and before Katie could respond, it was already done. This was after, Katie said, the doctor and some staff had shared a chuckle at her birth plan in her presence. So, Katie was upset to find out that SeeBaby and Dr. Bootstaylor were under fire at Dekalb not once, but twice this year, with hospital policies changing to restrict patient choice in a way that seemed targeted at SeeBaby patients. Finally, in May, the practice’s privileges at the hospital were suspended with just two hours notice–leaving pregnant women scrambling. It happened so fast that some of them even showed up to give birth at the hospital without realizing that their care providers could not attend them. Even more stunning for Katie was finding out that Dr. Mandeville was the head of OB as all this went down. Hear all about Katie’s story, as well as from local mother Zawn Villines, who has led the very effective community protests and organizing against the changes at Dekalb. UPDATE: Here is local coverage on the May 19 protest of Dekalb Medical. SeeBaby Midwifery has since moved its practice to a new facility in Atlanta and is serving families there currently. 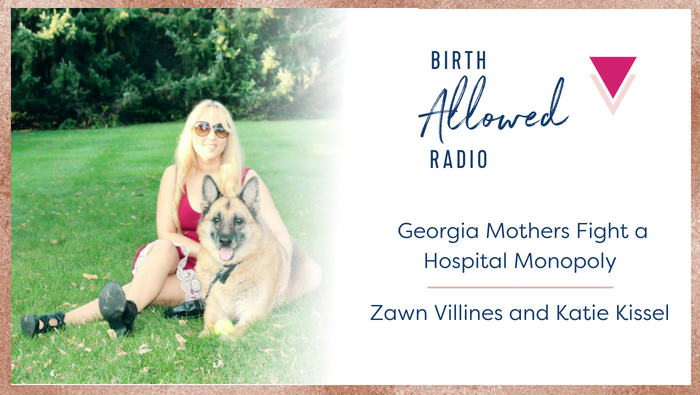 Click here for more episodes of Birth Allowed Radio. Support the show! Review us on iTunes, SoundCloud, or wherever you listen.